This page concerns antennas, the third characteristic of successful DXers, the first being skills and the second, location. Despite the advertisers’ claims, radios trail the field in fourth place. I have acres of space with two small towers and many big old trees supporting wire antennas. The trees make good sky-hooks but the lower side branches tend to snag the ropes and wires. I trimmed a few of the eeasier ones very gingerly from the bucket of a cherry picker before chickening-out. I could do with a tree surgeon to finish the job properly. My first tower was fixed, 12m high, made from welded angle iron. I think it might once have supported a windmill for a water pump. It’s heavy at about 150kg and probably strong enough to free stand but for safety and peace of mind, particularly when I’m climbing the thing, I guyed it top and middle. A second tower, also only about 12m high, is a wind-up tilt-over design, ideal for testing and tweaking antennas. The beams are only about 12-14m off the ground, quite low in wavelength terms but it helps enormously to be perched on top of a 260m hilltop from which the ground slopes steeply away all round. My third tower replaced the first: it tilts over but doesn’t telescope, so the stresses on the base and the luffing pulleys are enormous. I was happy to have the base refurbished and rewelded by Red Steel, an excellent local steel firm in Napier. If you’ve seen the pathetic mess I make of welding, you’ll understand my relief to get the job done properly! 80m - a temporary full wave wire delta loop suspended from a tree with the peak currently less than 20m up. The antenna is oriented in a North-South plane and fed in the centre of the bottom (horizontally polarized) with a quarterwave of 75 ohm coax to match it to the 50 ohm feedline, through a homebrew balun. It is not working well at all on 80: I used to have a square loop suspended between two 25m treetops but that got well and truly knitted into the trees by a passing cyclone a year ago. I need to replace it. It was a much better DX antenna. 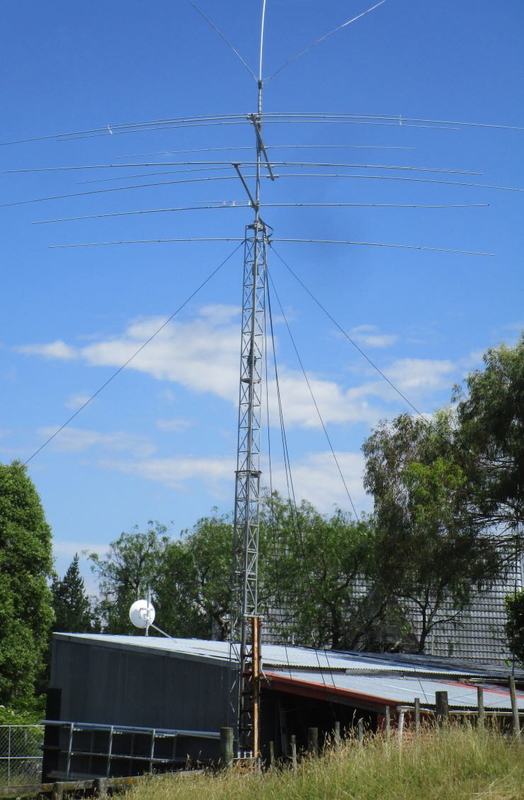 60m - I started with a temporary lash-up - a quarter wave wire vertical pulled up to the peak of the roof over a dozen radials laid on the lawn directly outside the shack. It worked OK, the main constraint being our license limit of 10 watts EIRP. The antenna will soon be relocated, perhaps replaced with a loop. 40m - I’m currently using the 80m delta loop on 40m through an ATU. It’s a poor performer but at least I am QRV. I’m surprised it works at all! 30m - a quarter wave wire vertical supported on a roach pole above the tin roof of my workshop. Works very nicely for such a simple setup. It is just at the right edge of this photo, almost invisible, a stealth antenna! 20+15+10m - I’m very slowly building a 2-element instant-reverse 5-band quad. Meanwhile I make do with a neat little 2 element triband Yagi built by my pal Lee ZL2AL (SK). It has an interesting trapless parasitic feed arrangement with interlaced elements. 17m - a nice 3 element monoband Yagi below the tribander is on long-term loan from my pal ZL2AAA. Morrie built it for the ZL7T DXpedition. Evidently it still has plenty of DX left in it. 12m - perched above the tribander and 17m beams is a full wave wire delta loop supported on a homebrew welded bracket holding two weedy fibreglass spreaders and a central PVC pipe. It works surprisingly well for such an ugly beast, a temporary antenna that has lasted several years with just one repair so far. Being just over a wavelength above ground, it has some directivity which makes me wonder if my LF loops are far too low! All my antennas use homebrew QRO ferrite baluns. 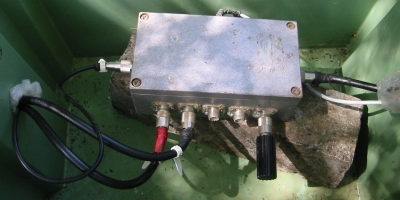 The antennas are selected using homebrew remote antenna switches like this one. They use “B1B” SPST vacuum relays from Russia. The relays aren’t exactly cheap but it sure beats paying $$$ to coax-feed all the antennas separately. Note the small dummy load on the rightmost antenna port, useful to check from the shack end that the feeder and switch are working properly. The long feeders run partly underground. It was a tedious job hand-digging the trenches but the thought of reducing the local QRM from our computers etc. kept me going. Simple wire antennas like dipoles and verticals are dead easy and very cheap to make: here’s how. A feedpoint insulator/connector, with a balun if you are feeding a balanced antenna with coax (e.g. a conventional dipole). There are several home-brew options here ranging from suitable pieces of wood, Perspex sheet, plastic or ceramic Tees or open-wire insulators, up to commercial centre pieces with built-in coax connectors. Personally, I like to make up my own IP56-sealed plastic balun boxes using a toroid plus stainless steel bolts with stainless wing nuts for the antenna wires and either SO239 connectors or long coax pigtails terminated with in-line SO239s (again, to avoid unnecessary connectors and save the odd tenth of a dB - they all add up!). You should probably use ring terminal connectors of approximately 6mm to terminate and connect each leg of a dipole at the centre point, but soldered/tinned loops in the end of the wires will do. For wire verticals, it is possible to solder the antenna wire and earth wires directly to the feeder, then wrap the feed point with self-amalgam tape. “Chocolate block” screw-down electrical connectors can be useful when experimenting with new antenna designs but don’t rely on them for permanent fixtures as they corrode quickly. Coax or open wire feeder, more than enough to reach from the antenna feedpoint once erected to the shack or remote antenna switch. Don’t go overboard but a few extra metres will allow for antenna movement in the wind and positioning the feeder to avoid garotting passing animals. Open wire feeder has negligible losses but the balun and ATU put the losses back in and add complexity, so open wire is only really worthwhile for a multiband doublet antenna, vee-beam or rhombic (dream on). Antenna end insulators. Ceramic ones will last approximately forever (barring accidentally dropping them on the ground or over-stressing them) but are heavier and are quite scarce. Plastic ones will last up to a decade. Electric fence wire insulators are good if you have a farm supplies shop nearby, as they are designed to insulate tens of kilovolts for longterm outdoor use. Bits of Perspex or other strong plastic sheet can be cut to size. At a push, you may be lucky just using the plastic cord (see below) but it tends to start conducting when wet so the resonant point and match will change in the rain. Self-amalgamating tape or coax sealant (NOT ordinary insulating tape - it won’t last more than a few days or weeks, although it does help protect the self-amalg from the sun’s UV). A wooden winder board on which to wind the antenna. Make these from offcuts of plywood or thin MDF board approximately 30 x 15cm, with U-shaped notches in both short ends to hold the wire in place as you wind. Trust me, it’s quicker in the long run to make a bunch of these up and use them routinely than to untangle the wires and ropes/cords every time you go to erect a stored antenna. Plastic cord to hoist the antenna. Fairly cheap, thin nylon or polypropylene cord is fine to hold out the ends of a small to medium-sized dipole or vertical, and lasts for ages if not over -stressed. You will need thicker cord or rope (up to about 4-6mm) for large antennas and to hoist the balun and feeder of a dipole. Measure out the exact wire lengths you will need and cut the wire. I usually do this by clamping the end of the wire plus the end of a long tape measure (another toolbox investment) in the workshop vice (there’s another!) and walking them out into the yard. If you have, say, a convenient fence or wall at least 10m long and some patience, you could measure and mark it permanently with paint or similar markers to use it as a giant ruler. Err on the long side as you will trim the antenna down to resonance later but adding wire would involve soldering bits on, preferably using a decent butane-powered soldering iron (yet another worthwhile investment). Make up the feed point. Seal the coax feed point with self-amalgam tape or coax sealant. Take care over this as water in the coax ruins it forever. Label the feedpoint with the band/type of antenna. I sometimes add short lengths of shrink -wrap on the centre ends of the antenna wires in order to label them. Marker pens work for up to a year before fading in the sun. Erect the antenna and test it for resonance. It’s best and safest to erect it all the way to its finished position as resonance and match will vary nearer the ground. Bring the antenna down, trim a few cm off the ends, put it back up, re-test for resonance and repeat until done. If you get smart, calculating exactly how much you need to trim off, you will inevitably cut off too much at some point. As I said, err on the long side. There are several parameters to adjust when it comes to antennas but essentially the choices come down to gain (in both horizontal/azimuth and vertical/elevation planes, don’t forget) and pattern. I’ve had good DX results with vertical quarter-waves and inverted-vee dipoles, with reasonably low take-off angles and more-or-less omnidirectional in azimuth. I’ve never had tall enough towers at home to make horizontal antennas perform as per the textbooks (except in local contests where the high-angle radiation is useful) but even ground-mounted verticals seem to work well. I suspend miscellaneous wire antennas in the trees from time to time. Loops seem to work better than verticals and dipoles, presumably due to their higher radiation resistance - around 125 ohms according to the books - and hence higher efficiency. Some experts claim they have lower angle radiation than dipoles but I’m not sure about that, and both factors presumably depend on their height above ground. They do seem to be low noise antennas, although that’s purely subjective. Whatever, loops work well for me. I was tempted to try 5/8th wave verticals until I read a paper by W4RNL modelling them against quarter waves and vertical dipoles. The improvements in gain and low take-off angle just don’t seem worth it. I’m sure multi-element vertical beams would be better. One day I’ll have to measure my ground conductivity and dielectric constant: meanwhile I use an estimate based on the ARRL Antenna Book’s values for my type of soil (around 6-9 inches of topsoil on a clay base on a forested hilltop), namely 5 to 6 milli-Siemens per metre conductivity and dielectric constant of 13. My first antenna experiment in ZL was simply to add additional wires in parallel to the existing 40m quarter wave vertical, using the same coax feed and ground plane. I added 30m and 80m quarter waves - the 80m one makes an inverted-L. They seemed to work, after a fashion, but were noisy on receive. That’s a FAIL. The design is based on a receiving antenna shown in The Radiotron Designers Handbook of 1953. 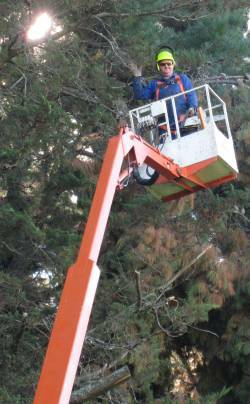 The 160m vertical will be an inverted L as even our tallest trees are not quite 40m - more like 30m at a guess. The earth mat will be a combination of deer fencing and wire radials. The antennas will be separated by a convenient distance along the cord - a few metres each(I’ll have to lay the lines out on the ground to set it up). I could use two cords from the top, alternating the verticals to spread them laterally as well as along the cord, but the single cord design looks easier. I’m hoping the magic of resonance will effectively feed one vertical per band, although on 40m the topband vertical will accept some RF so the match may need adjustment on 40m and the pattern may be high angle - in which case I’ll just have to try something different (an L-match or low-pass filter feeding the 160m vertical maybe, a high pass filter for the 40m vertical, a remote relay at the base or a completely separate 40m antenna). Yet another possibility is quarter-wave vertical/L for 160m, end-fed on 80m with a relay-switched matching unit such as those described by AA5TB. So many antennas in mind, so little time! The design is easy enough: four identical quarter wave vertical antennas set at the corners of a square with quarter wave sides. Using the simplest feed arrangement, the antenna fires across the diagonals giving one of four directions: it needs a negative phase shift on the forward antenna relative to the sides, while the rear antenna needs a positive phase shift. The pattern is cardioid. Patrick TK5EP published a simple circuit for a 4-square hybrid coupler using three DPDT relays and a 3-core control line to switch directions. I created an Excel spreadsheet using textbook formulae and the manufacturer’s AL values for various Micrometals powdered-iron toroids to confirm TK5EP’s component values for 40m. By my calculations, T300-2 cores give exactly the right inductance and can handle more power than the T200-2’s favoured by TK5EP ... but for practical reasons to do with the length of the fibreglass poles I had on hand, I started with a 30m version to prove the concept. The tin roof of my workshop makes an excellent groundplane, roughly 10m square as it happens (it was rectangular so I added a tin roof woodshed to make it squarer). The antenna elements are wires, attached to fibreglass roach poles using rings of heatshrink tubing. The poles are a push-fit into surprisingly strong adjustable angled base fittings made to hold Sky satellite dishes, a very convenient arrangement. The purple wire is the earth connection to the coax outer, relying on metal to metal contact of the fitting to the galvanized steel shed to couple it in to the main roof area. The calculated inductance values in the hybrid coupler on 30m require 8 turn coils on T300-2 cores, but for some as-yet unknown reason, my shiny new LCR meter from Hong Kong measures them at more than twice the target inductance (the calculations and inductance values are correct, but the meter is wrong, although it measures small potted inductors of a similar value correctly). The coupler needs two 156pF capacitors: I could only find 100pF HV capacitors in my junk box, so added some coax tail capacitors in parallel in the first version. Here’s the coupler with the original 100pF capacitors in place, just before I added the coax tails. The toroids are cable-tied to a chunk of PVC pipe to keep them in place. The device on the right is a 50 ohm ceramic power resistor bolted to an over-sized heatsink, since I didn’t know how much power would be lost due to imbalances in the system. The hybrid coupler phasing/switching box is inside the workshop, screwed to a rafter under the tin roof. It’s more accessible and waterproof there than it would be sitting outside. Morrie ZL2AAA gave me some 150pF mica capacitors and confirmed the calculated inductance values with his LCR meter (thanks Morrie!). Perhaps I should dust off the old scope to check the phasing too ... but anyway, it works! I get about 2 or 3 S-points difference front -to-back and signals are about 1-2 S-points lower off the sides. At last I can tell whether signals from Europe are coming via the long or short path. Direction switching is instantaneous of course. Unfortunately, erecting a tower next to the workshop messed up the 4-sq beam pattern and matching so I reverted to a single quarter wave vertical ground plane instead, and that does just fine. Feedpoint impedances are calculated to be around 100 to 125 ohms being mostly resistive with just a little reactance. I guess a 2:1 toroidal balun at the common feedpoint would present a good match for 50 ohm coax, reducing the common mode current if a balun were not used. Using the spider quad design (i.e. spreaders radiating from the centre point of the array), the spreaders would need be about 10 feet (3m) long. I should be able to fabricate a spider centre using a short boom of square steel box section with angle-iron supports welded on at 62 degrees to attach the support arms. To attach the antenna to a round steel mast (a 2” diameter steel scaffold pole in my case), the end of the mast will need to be grooved to fit the corner of the box section steel, and then welded on: in practice, I’ll probably weld on a short stub of smaller diameter steel pipe that will sit snugly inside the main mast, with a locking pin through the main mast and stub to stop the antenna turning relative to the mast. Big parafoil kites are ideal for lifting wire aerials, given quite a bit of wind and lots of space. Parafoils are spar-less, nylon kites that fold up into a small rucksack. Their aerofoil section (rather like a skydiver's parachute) gives loads of lift and they are fairly static in the sky (no good for aerobatics or fighting, ideal for hoisting aerials). My 5 ft-wide parafoil kite will lift a top-band quarter-wave wire in a decent steady wind (Beaufort force 3 or above), and I've used it to hoist vertical dipoles, inverted-Vees etc. using slotted plastic twin-feeder rather than coax (it's lighter and lower loss). In fact, it gives so much lift that it's a real handful in a strong breeze (force 5+) - I struggle to pull it down. 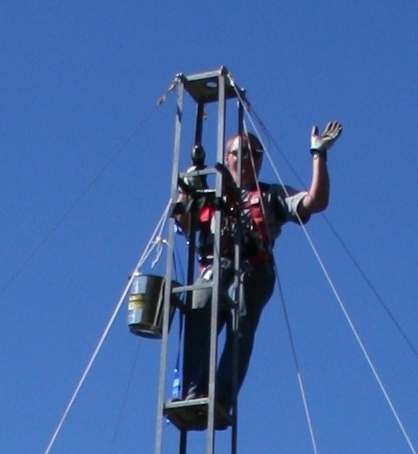 For lots more ideas on kite and balloon-hoisted LF antennas, visit G4VGO’s site. How many radials should I put down? Should I lay them on the surface, bury them or elevate them? What if I can’t lay them out symmetrically? So, it’s a refreshing change to read a scientific study of radials for vertical antennas by a dedicated amateur, Rudy Severns, N6LF. It’s obvious from Rudy’s excellent articles in QEX that he knows his stuff. He has carefully researched the professional and amateur literature and then designed and painstakingly conducted the controlled experiments to check out various theories in practice. Use sixteen to thirty-two ¼λ radials on the ground , or at least four elevated ¼λ radials. If you don’t have the space for ¼λ radials, lay down a larger number of shorter ones. The shorter your antenna, or the poorer your soil, the more you need a good ground system. A surface-radial ground system will affect the resonant frequency and you may have to adjust the vertical height for that. Aside from the earth system, work hard at making the antenna itself more efficient. In other words, use high-Q loading coils, use top loading to minimize the size of loading coils, minimize conductor loss and so on. Note that sixteen is not a magic number for on-ground radials. The experimental data indicate marginal improvements with more radials but rapidly diminishing returns probably make the effort pointless above about 32 radials and, as the last bullet suggests, we are probably better-off optimising other parts of the system (such as the radiator, the feeder, the rig, the operator and the QTH - plenty of improvement opportunities!) rather than the radials. Unless you are absolutely desperate to squeeze the last tenth of a dB out of your earth mat, there is no practical value in going beyond 32 radials . Those guys who lay out 100+ radials will do their utmost to convince you that it was well worth the effort, and in psychological terms they may be right, but scientifically -speaking, they are somewhat deluded. Just because 120 radials happens to be the standard in broadcasting doesn’t mean it is appropriate. If you use too few on-earth radials (e.g. just 4), their lengths become critical - in other words they are resonating, which leads to the counterintuitive finding that reducing their lengths to hit resonance may actually improve their efficiency! Experiments simulating installations where there is no room for ¼λ radials right around the base of a vertical indicate that symmetry is fairly important. Efficiency is slightly reduced if one quarter of the circle is empty, and losses mount to as much as 3 dB (half your power!) if you can only lay radials in a semicircle. However, substituting the missing radials with more, shorter ones in the directions that you can lay radials offsets the effect a bit. Another fascinating insight from Rudy’s experiments is that numerous factors affect the effectiveness of the radials, including for example the soil conductivity which varies with geology, moisture levels and band. Unless you can measure and control these factors, theoretical calculations from antenna modelling may not hold true in real installations, hence the value of careful experimental studies like Rudy’s.